New York City’s Hell’s Kitchen has certainly come a long way in the past twenty years. While formerly an area of seediness and crime, today the expanse of blocks west and south of Central Park is home to some of the city’s best bars, restaurants, clubs and theatre. For the perfect night in Hell’s Kitchen, start by heading to 55th Street to Kashkaval; a Lebanese and Greek tapas restaurant with a gourmet Mediterranean deli and cheese shop in the front. Perfect for a romantic but unique dinner, Kashkaval has a full bar with an assortment of great wines, and is cozy and small, seating around 30 people. Choose from an exotic and extensive list of tapas dishes such as cheese fondue with chunks of delicious baguette bread, Mediterranean artichoke dip and Russian bean salads. No visit to New York is complete without seeing a Broadway show. Live theater is hot again, so head to the heart of Times Square and catch a musical. I suggest “Wicked” for real musical-lovers, but if you are skeptical about paying lots of money to watch actors break out in song, buy a ticket to “Avenue Q.” This Tony Award winning show is a crass and hilarious spoof of Sesame Street. This adult only musical will have you laughing out loud. After the show, check out the Hudson Hotel. This landmark located on West 58th Street between Broadway and Columbus has something for everyone. Their swanky bar on the 2nd floor is always full of gorgeous people, has new inventive cocktails to try, a glass dance floor that lights up and on Friday and Saturday nights, turns into a bona fide club. On the same floor, head outside to the Private Park. Made to look like Central Park; an area to enjoy your drink on nice nights, grab a smoke, or just admire the trees and jungle-like atmosphere on the roof. Before leaving wander around this gorgeous hotel and sit in their library. At night, there is a fire roaring, and you can order drinks from a cocktail waitress while sitting in an overstuffed armchair. Definitely make the time to check out some live jazz and to do so, take any subway line to the Times Square stop and walk to Birdland Jazz Club on 44th street. While a little pricey, this venue is worth a visit because of the quality of performers and that it’s such an institution for jazz in the city. Since 1949, Birdland has been the most famous jazz club in the state, and draws hordes of tourists and locals alike. Because it’s the city that never sleeps, head a few blocks North to Therapy on 52nd street. This former two-level warehouse is great spot for a cocktail, most of which are named after disorders for which one may require “therapy.” Technically a gay club, this lounge is now the hottest and most spacious place in the area and to mingle with people of all sexual orientations. The best part about it? No cover charge even on Friday or Saturday nights and its open until 4 in the morning. If shaking your groove thing isn’t your thing, catch a comedy show at Caroline’s on Broadway between 49th and 50th streets. The comics that perform at this stand-up institution range from celebrities like Jon Stewart and Ray Romano to newcomer and New York’s own Jeremy Schachter. A place you can see a comedian…and they’re actually funny. With your night winding down, head to the Tick Tock Diner on 8th avenue across from Madison Square Garden. Open 24/7, this is the perfect place to get greasy diner food after the clubs let out in the wee hours of the morning and the perfect place for people watching if you grab a table by the window. 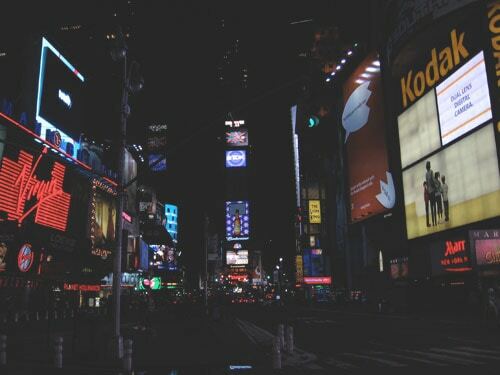 These are just a few options in the city that never sleeps. The only thing you might be short on is enough time in which to experience it all! Helpful Tip: For a real deal on tickets head to the Marriot Marquis Hotel to the TKTS booth, where tickets are sold for Broadway shows the day of, and for half off the regular price. Come early cause the line can be long and bring cash, cause that is all the accept. Katy Franklin is an aspiring writer who has lived in Washington DC, Chicago, New York, and now resides in Los Angeles. She loves to travel, and has loved the culture and nightlife in all of the places she has visited. She hopes to continue to travel the country, and write about her experiences. She can be reached at katy.franklin@gmail.com.